"Tips and advice on dog toilet training"
Start your toilet training program as soon as your puppy arrives, establish good regular routines, feeding times, usual toilet times, also encourage set living and sleeping area with puppies own bed and a designated elimination area outside. Every time your dog wants to relieve himself he should have access to the designated area, always take him out first thing in the morning, after meals, naps, play time and just before bed. 1 hour for each month, a 2 month old puppy can only hold for about 2 hours, bowel movements often after meals. When starting your toilet training you need to be aware that puppies under three months old have limited bladder control, so it is a good idea to limit his access to all of the house either by crate training your puppy or by having a den area i.e. a small room ( laundry) where he can be if you cannot closely supervise him. Many dogs seem to prefer a Crate the where they can still see you and be near to the action even if they are contained. As your puppy becomes more reliable and his bowel and bladder control develops allow him more time out of the crate. 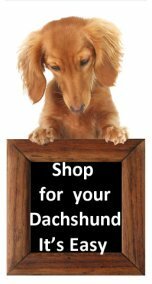 House training does take time and you need to be aware that when your dachshund starts sniffing around and turning in circles, it usually means he is looking for a place to relieve himself so you need to be alert and take him quickly outside. If your puppy is in a crate he will usually whine or bark first thing in the morning to go outside, carry your puppy outside, as they will often urinate as soon as you take them out of the crate or den and put on the lead for control. With dog toilet training when ever your dog uses the designed area, give lots of praise, make a fuss, give a treat, and return indoors. It is helpful to give a command such as ‘go toilet’ so your dog associates the command with the action, use the command every time until it is accepted by your puppy. If your puppy has an accident inside you must ensure you clean up properly not leaving any trace or smell, as the smell it will encourage him to go there again, there are products available to help with this problem, don’t punish for mistakes, this leads to puppy’s confusion, you need to be better organized, and alert. If you cannot get outside easily e.g..in an apartment use a hygienic toilet mat, litter box or newspapers. Newspapers are not such a good choice as it can become a problem as the puppy will use any paper it finds lying around. Keep the designated area clean and free of faeces. 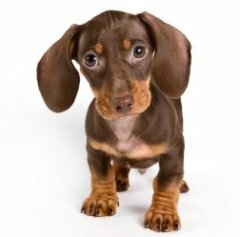 Dog toilet training will not be complete until puppies are about six months old, at this stage you can consider the option of a pet door to give you and your dog freedom.